Lord Coe, the chairman of London 2012, says Glasgow is in position to hold the best ever Commonwealth Games in 2014. Coe, head of the British Olympic Association, says there is an "extraordinary opportunity" over the next decade to inspire a generation. "There is absolutely no reason why every event should not be better than the one before," he said. "It's very important that Glasgow is a huge success and I know they will be massively successful." The former middle-distance runner would encourage the world's "big competitors" come to Glasgow next year. "The best assessment that is made of a career is about medals won in major championships," he explained. "If you're not here, you can't win medals. "The top competitors should understand that those championships are an opportunity for young people to be inspired by them. "The opportunity for Glasgow to have the world focussing on them for a fortnight in 2014 is a very unique position for any city to be in. "I know that Glasgow will want to make the very most of that." 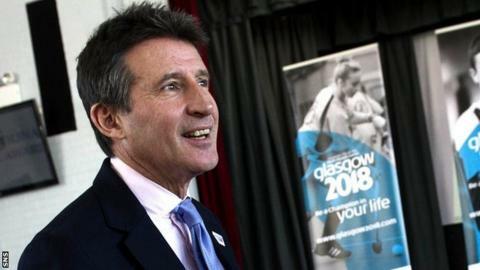 Coe believes the whole of Scotland will feel the benefit of Glasgow 2014, which puts the city in a great position to host the 2018 Youth Olympics. Three other cities are in the running, with the final decision on the venue due in the summer. "[It is a] fantastic opportunity to come back to this city, having already been inspired in a large part by the Commonwealth Games," he added. "A new generation of young people coming to Glasgow for, not just competition, but also cultural, educational and social opportunities - that's what the Youth Olympic Games is about. "It's not just simply about elite competition. The competition is exciting and the young talent on display breathtaking in its ability but it's also about experiencing some of the global impact that sport makes. "Having the opportunity for young people, both domestically and from overseas, understanding a lot more about themselves; sport uniquely can do that." You can follow Kheredine Idessane on Twitter.